Several months ago Jonathan gave me some cash and the day off. (Bless that man. Long may he live.) Of course, I spent the time (and the money) at several used bookstores in the area (and slightly out of the area). Since I had time to browse, I did. One of the books I picked out on a whim that day was The Magic Pudding , by Norman Lindsay. First published in 1918, this book represents a piece of classic Australian literature. (That's what I found so fascinating in the first place. Not that I didn't expect that Australia had any children's authors but that I had never read them.) In the case of The Magic Pudding , being The Adventures of Bunyip Bluegum, I am so glad I took the gamble. 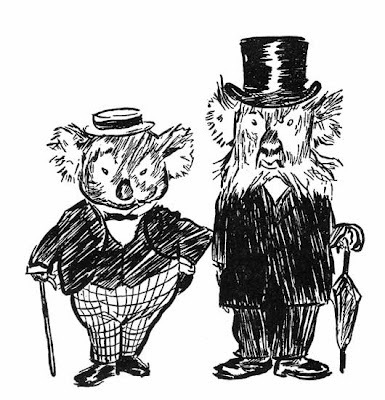 Bunyip Bluegum is a koala bear who leaves home because he does not like his uncle's wiskers. (They get in the food, you see.) He throws in with Barnacle Bill, a sailor, and Sam Sawnoff, a penguin, who are the joint owners of a bowl of magic pudding who goes by "Puddin'." This pudding is magical because no matter how much you eat of it, it just grows some more. Also, it can be whatever you'd like it to be: a steak, a donut or an apple dumpling. Bill and Sam invite Bunyip to join them as a co-pudding owner and the three of them merrily gad about in general laziness, eating whenever they please, and making up songs to tell of their adventures. If it were not for a small gang of pudding thieves, their lives would be very peaceful indeed! What makes this story so awesome is the humor of Norman Lindsay. I was thinking all along that the book reminded me a bit of Alice in Wonderland, and I've since seen some other people compare it to the same. Lindsay interjects many songs and poems throughout the book which draws the first comparison. Lindsay made me laugh outloud on more than one occasion reading about the bizarre situations that Bluegum and pals got themselves into and seeing how they would get out of them. "This ia s frontways view of Bunyip Bluegum and his Uncle Wattleberry. At a glance you can see what a fine, round, splendid fellow Bunyip Bluegum is, without me telling you. At a second glance you can see the Uncle is more square than round, and that his face has whiskers on it." "The Society of Puddin'-Owners were up bright and early next morning, and had the billy on and tea made before six o'clock, which is the best part of the day, because the world has just had his face washed, and the air smells like Pears' soap." The Society of Puddin' Owners is constantly being hounded by a pair of puddin' thieves, Possum and Wombat, who disguise themselves in silly ways in order to get close to the puddin'. As such, Bill is forever suspecting anyone who looks remotely "funny" to be a puddin' thief in disguise. At one point, he assumes that Uncle Wattleberry's whiskers are a disguise and he attacks the Uncle to try to pull the whiskers off. "Apologies are totally inadequate," shouted Uncle Wattleberry. "Nothing short of felling you to the earth with an umbrella could possibly atone for this outrage. you are a danger to the whisker-growing public." And so on and so forth. I was supremely delighted as I read along. I was also delighted that a full-length feature film was released by the same title, but apparently it was derided as being an awful depiction of the book, heavily deviating from the story. You really have to stick to the story to keep the charm so I'll not likely watch the film! As I mentioned, this book was originally published in 1918 and has it has been reprinted numerous times since. Apparently Lindsay wrote this book to settle an argument with his friend Bertram Stevens. Stevens said that children liked to read mostly about fairies and Lindsay said that they liked to read about food. Personally I think children like to read about both but I'm glad Lindsay felt the need to prove a point! As for making points, he made his quite well. This book has been translated into a variety of languages including Japanese and German and has remained in print ever since. A highly recommended treat to be sure! I'm marking this one as a favorite. That sounds hilarious. I shall keep my eye out for it! I love the illustrations! What a treasure! Cash and a day off--sounds delightful! And this book sounds like it would be a very fun readaloud. I'll have to keep an eye out for it. Another interesting obscure book. Thanks! Long may he live indeed! And this review was a delight to read. What a fun book you found. Blindly Bill is another old Aussie Book about a koala. In this case, a very naughty one! 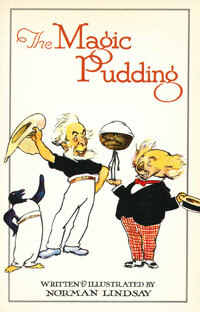 Magic Pudding is one of the great classics of Australian Children's Literature. I'm glad you enjoyed it!